Today we are interviewing Kenyon Ledford, author of the detective parody/jungle adventure "The Big Monster Monkey." When I was five I wrote a poem that went like this: “I have a cat with a question mark tail, and she likes to ride on the monorail.” Looking back, I haven’t improved much in that genre. Also, though I’m addicted to rain, I live in a land of lizards and butterflies. Whatever. My dog, Huckleberry, thinks it’s all in my head. Shut up, bad dog! 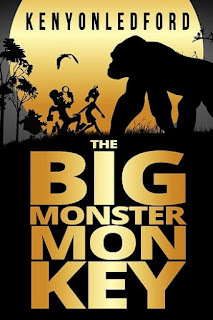 Describe the plot of "The Big Monster Monkey" in a few sentences. It’s the age-old story of mental patients going off their meds and escaping the hospital to go traipsing along on a mad jungle adventure in search of a mythical beast. I think. People who laugh and high-five when they see a child crying. What inspired you to write a story about mental patients off their meds in search of a mythical beast in a fantastical jungle? I was staring out the window at work for way too long one day while neither thinking or working. Soon, I began pondering if a huge monkey would be a monster monkey or a gorilla. Tell us a bit about the protagonist, Witherspoon, PI. Witherspoon is smug with no reason to be, cowardly with every reason to be, and speaks with a fake English accent. I would love to say Doestoevsky, because I’ve read everything by him and he’s almost my best friend. It would also make me sound pretty cool. Alas, my writing is mostly influenced by Woody Allen, who I think was influenced by Aristophanes. A long time. A very long time. And if I answer “No, what?” the creative process begins to flow. Once my manuscript is finished, I share it with my local writing group. They then toss coffee into my face and throw bagel scraps at me. At that point I know it’s time to publish. I have been lucky to be tutored in song writing by the legendary Nik Venet, and in fiction writing I’ve had some great, tough instructors as well. They are the people who tore me down when I thought I was great, then praised me when I started becoming good. California gold rush! Everybody get in there, let’s go! Yee-haw! I’m writing "Batcave Blues." It’s a novel based on my Batman and Robin parodies that came from my Jonny Gonzo and Money Man flash fiction series. Yes. If they have been totally freaking morose since “America’s Funniest Home Videos” went off the air, (it did, didn’t it?) then they should go ahead and take a pass on The Big Monster Monkey.